During 1984 riots, Rajiv Gandhi sent me to Gurdwara Rakabganj Road to stop a mob of Congressmen from attacking it, clarifies Kamal Nath. New Delhi: There is “nothing conclusive” about the anti-BJP alliance announced in Uttar Pradesh Saturday for the Lok Sabha elections, Madhya Pradesh chief minister Kamal Nath has said, suggesting that while the Samajwadi Party (SP) and the Bahujan Samaj Party (BSP) might have kept the Congress out and declared their alliance and seat-sharing formula, there was no final word on it yet. 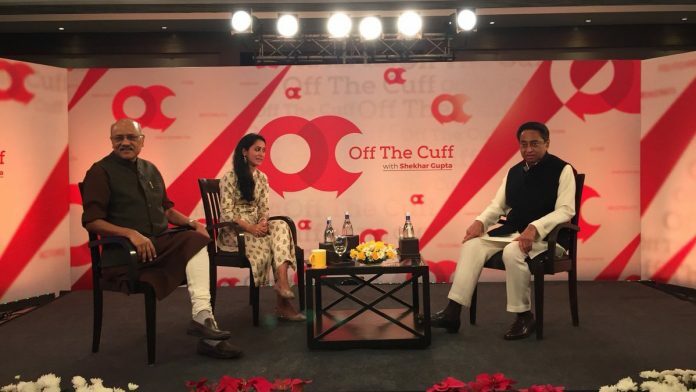 In conversation with ThePrint’s Editor-in-Chief Shekhar Gupta and associate editor Neelam Pandey at Off The Cuff, Nath played down the SP-BSP decision to keep the Congress out of the alliance, saying that they were “in it together”. “We don’t want seats to lose. We want seats to win. What we want should not damage the BSP or the SP. We are in it together,” Nath said. During the chat, Nath, for the first time ever, also gave a detailed rebuttal to allegations about his involvement in the 1984 anti-Sikh riots, and explained the reason behind his oft-cited presence at Gurdwara Rakabganj where a mob had laid siege. According to Nath, the then Prime Minister Rajiv Gandhi had asked him to go to Gurdwara Rakabganj Road to control a mob of Congressmen preparing to attack it. “I went there. I found Mr Gautam Kaul (Indira Gandhi’s cousin) there. He said, ‘This crowd is here. Control them for 10 minutes. My force is coming. I don’t have adequate force.’ So I started talking to them,” Nath added. “I was the general secretary of the Congress party in charge of Delhi, where the riots took place, nobody said anything. It’s only now that it is being raised. So I leave it to your judgment to realise how political it is. No charge no FIR, no case,” he added. “Then the BJP government set up a commission of inquiry. Somebody went and filed an affidavit a couple of years ago… That inquiry, we know what it says. It says it didn’t charge me. Now, suddenly, when I become chief minister, everybody has started charging me. In all these years, the Sikh community has honoured me, felicitated me. Nobody has said anything. Suddenly it comes up,” said Nath, who assumed office as chief minister last month. Nath also took a swipe at Prime Minister Narendra Modi, saying he was not loved, but feared. The Bharatiya Janata Party (BJP) won the 2014 elections with 31 per cent of the votes, which means 69 per cent of India’s voters were against it, he added. “It isn’t by opposing alone that you win elections, it is by exposing. The BJP today stands exposed,” Nath said. Nath conceded that his predecessor, former Madhya Pradesh chief minister Shivraj Singh Chouhan, wasn’t an unpopular leader and it was attacking Narendra Modi that got him “more cheers”. He also sought to reject the controversy over his government’s decision to reportedly stop the practice of government officials singing ‘Vande Mataram’ on the first day of every month before starting work. “I said they will march from a park. I said the police band will go with them and let the public join in,” he added. “And I’ll make this a tourist attraction. Like you have the changing of guard at the UK’s Buckingham Palace. They will start from Shreya Park, police band and everyone will be there,” he said. Talking about last year’s assembly election, Nath said that the BSP had “damaged” the Congress on 10-11 seats in the assembly elections. The Madhya Pradesh chief minister said he was now working on a land monetisation policy to raise resources for the state. He added that he would cancel the lease of all old coal mines that are not functional anymore, and use the land to build houses for the economically weaker sections. Nath hinted at “cleaning” the textbooks, stating that the BJP had used crores of government funds over the past 15 years to build a political apparatus. He said close to Rs 1,000 crore was spent on this parishad, adding that his government would set up an “apolitical jan aayog” to investigate alleged corruption by the previous government. Cong conveniently forgets atrocities this party has done against Muslims. There have been dozens of riots against Muslims under the rule of Cong Govt. The culprits and instigators were never brought to justice, and victims were not compensated enough. You are not clean sir. History is evident, those who betrayed Sikh guru, they were suitably punished. Wait and watch. Wasn’t Kamal Nath feared by Sikhs, with their lives, in 1984? More than a ceremonial chanting of Vande Mataram, Madhya Pradesh needs a few successful, fully operational SEZs, out of the hundreds CM Kamal Nath sanctioned in Udyog Bhavan.